First is their wide range of conventional cast steel and ductile iron sheaves which range in size from 3" - 14" in nominal diameter. Second is the revolutionary ForgeFab--a superior strength line of wire rope sheaves which can be supplied without long delays--and at savings from 15-50% over traditional cast versions. Faced with increasing environmental restrictions, continuing material shortages and growing customer concern, Gunnebo Johnson set out to find a better way. They started by developing their own specialized equipment and ended up with an entirely new, patented process--one which did its job without castings, and did it in far less time. Each ForgeFab sheave begins as a computer driven, precision disc cut from proprietary chemistry alloy steel plate. 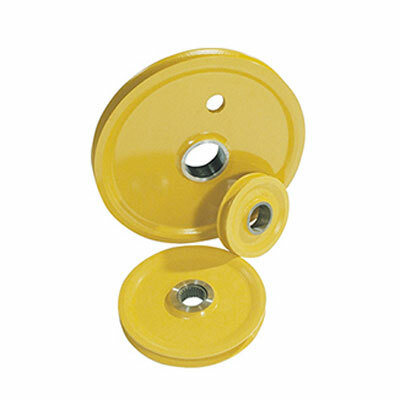 The steel disc is heated to forging temperature and its edge rotated against a system of staged rollers to forge the sheave rim and wire rope groove. A precisely machined hub is arc welded to the forged disc. A variety of welding techniques is used, including: fillet, submerged arc, partial penetration and full penetration, depending upon application. The result--a precision built ForgeFab sheave whose integral web/rim design is much stronger. ForgeFab sheaves are currently offered in sizes 16" -72", with flame hardened grooves standard on all sizes 16" and above. * While some sheaves may be on the shelf and ready to ship, many sheaves are made to order. Average lead time 2-4 weeks from date of order. If you need a firm delivery date, or an expedited shipment, please call us toll free at 800-442-7454.